January 2013 – Go. Find. Eunice Mae turns 90 today. I would love to tell you what she means to me, how important she has been to the emotional and physical survival of our family, but there aren’t enough words. She stepped in and stepped up when my parents’ divorced. She prays. She reads her Bible and she worries about the spiritual health of her family. She supported my conversion to Orthodoxy and tells everyone she meets they should go to Pascha because that’s pretty close to heaven here on earth. She is the Matriarch. 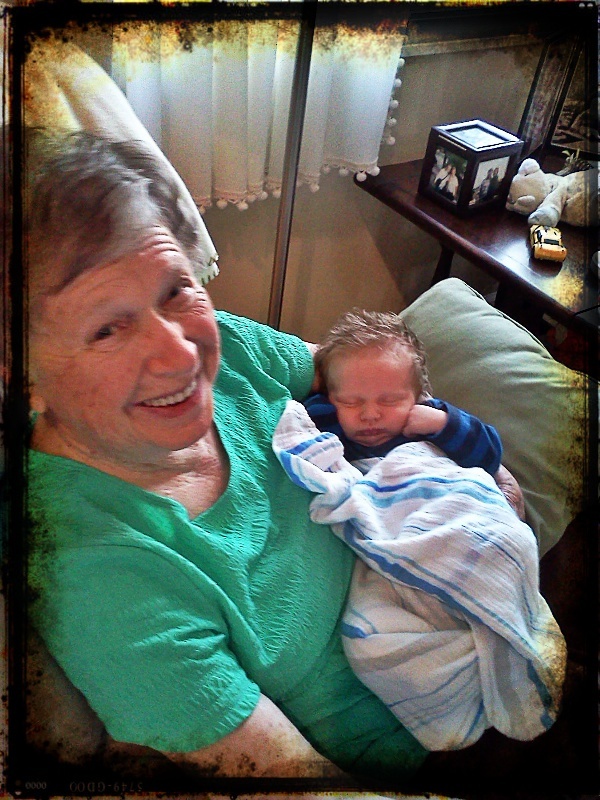 Her love for her great-grandchildren, who call her Oma, knows no condition, no reserve. It is as pure as possible. She is the life of the party–laughing at herself with ease and speed. And she loves a good debate, especially about theology or her favorite, politics. And she keeps growing and learning, at 90. The local library branch knows her by name, constantly being asked to order the latest book on the bipartisan divide, a biography of First Ladies, or whatever. She’s been like this, FOREVER. But this is what makes me the proudest, about how she grows. When I was younger, she possessed the latent racism of many of those who were white and conservative in the 50s and 60s. She didn’t mean to be, but in her head, an entire chunk of the planet’s population was inferior — morally, mentally, physically. But that didn’t last. It didn’t last because she became dissatisfied with it. She watched our basketball teammates at an inner city league where we played. She got to know the poor children of all colors and sizes with which I worked at a Boys and Girls Club. She took on Hispanic and black piano students (she still teaches). She got to know them. And she changed. In her 70s, she changed. Dramatically. She marched into the pastor’s office at her old mostly-white Baptist church to try to get them to sell, at a reduced rate, a building to a black Baptist church she liked because, as she told the pastor, it’s not like you’re using it as much as they will. After years of voting for Republicans, she cast her vote for Clinton. By the time Barack Obama was running for office, she was a poll worker for the local Democrats. On Election Night, 2007, she baked a ham and drove it down to Obama’s closest campaign headquarters. She has never, ever, baked me a ham. In the run-up to this election, she collected votes for Obama like she was on a scavenger hunt–the clerk at the Best Buy (check), the guy at the pharmacy inside the grocery store (check). Vote for him, she said, not because you agree with everything he does or says but because he’s been through things, because he pulled himself up and got himself in the White House. He has character, she said. I’ve read all his books, she said. He’s a smart man. So yesterday, on MLK Day, we watched the Inauguration while we made fancy mints for my upcoming wedding (five days away!!) She sat and smiled as she watched the Obamas walk up Pennsylvania Avenue, waiving to the crowd. You know, she said, black people are so special because they have had to overcome so much. Her face just beamed as she watched her president. My face beamed as I watched her. Happy birthday, Grandma! May God grant you many more years! !